There is comfort food and there are comfort books. Books that literally warm the cockles of the heart and leave you with a feel good factor. Books that do not depress and sometimes I think we all need that comfort reading. I have always enjoyed reading books that talk about food or have some element of food in them. I remember reading “Like Water for Chocolate” in one sitting and after every chapter; I only wanted to eat what Tita was cooking. When I finished reading, “Eat Pray Love” (which I didn’t enjoy at all), I wanted to take the next flight to Italy and only eat. Forget the Praying and the Loving. Food does wonders and food in books does better wonders. 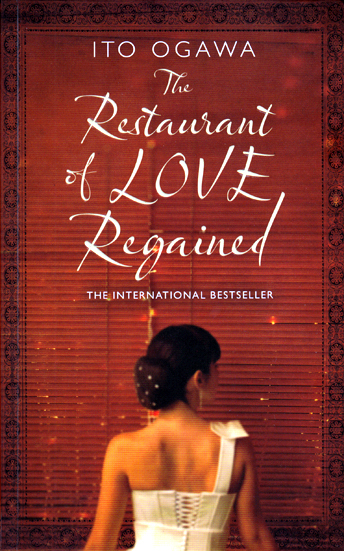 “The Restaurant of Love Regained” by Ito Ogawa is one such book. On reading the synopsis, one might think that it is the usual run of the mill story of a girl who loses it all and wants to regain it by coming back home. Well in parts it is that, and in parts it takes you completely by surprise. Let me try telling you what it is about without any spoiler. Rinko returns from work one day and finds everything gone. Her Indian boyfriend has taken everything away and nothing is left behind, including the old Meiji mortar she inherited from her Grandmother and the Le Creuset casserole she bought with her first salary. So she goes back home to her mother and her native village, who she left fifteen years ago. There she decides to open a very special restaurant, the one that serves food for only one couple every day based on their palette and wishes. The name of the restaurant is, “The Snail” and the food that Rinko serves acts as healing potions and cures customers’ heartaches and helps them find love again. Food as I suggested plays a major role in the book and not to forget Rinko’s culinary skills that add to the charm of the book. Having said that, I also felt at times that the translation could have been better in certain places. For instance, the part when Rinko conjures the idea of The Snail could have been translated keeping the original structuring in mind, which I felt was lost out on. The highlight of the book for me was the letter written to Rinko by her mother. At times barring the food and restaurant concept, I was quite tempted to compare the book to The Joy Luck Club, but then that is where some of the similarities ended and did not take over the book. All in all I quite enjoyed The Restaurant of Love Regained. The book may not be a brilliant read for sure, however it is quite a comfort read. Read it on a rainy day and let the book work some of its magic on you as well. This entry was posted in Alma Books, Books, Fiction, Penguin Books, Review and tagged food, Ito Ogawa, japan, loss, Love, Mother-Daughter Relationship, Restaurant, The Restaurant of Love Regained, The Snail, translation on October 7, 2011 by thehungryreader.